A regular-sized bar of Dairy Milk Marvellous Creations Jelly Popping Candy. What a strange and interesting chocolate bar. It’s not every day you find a chocolate bar with “Carbon Dioxide” listed in the ingredients. As Dairy Milk continues in their frantic mission to add just about everything imaginable into a chocolate bar – toffee bits, cookie dough, pretzel chunks, cashews, coconut, etc. 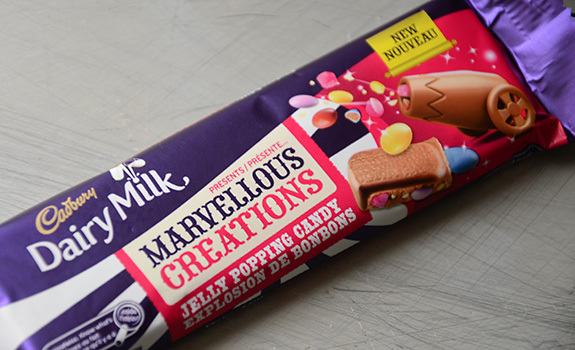 – this Dairy Milk Marvellous Creations Jelly Popping Candy bar stood out as particularly oddball. It doesn’t explicitly tell you what’s inside it on the wrapper; you’re supposed to put the pieces together yourself, based on the name and illustration. My guess is jelly beans, Skittles, Smarties and Pop Rocks, all buried in a slab of milk chocolate. I bought it to verify this theory. The Look: Old-time circus/carnival flair on the wrapper. Deliberately cryptic yet bold, like a barker enticing you to enter a sideshow tent. There are indeed chunks of candy embedded in the chocolate bar. It’s like someone dumped a corner of a candy store into a vat of chocolate, then made bars with it. The Taste: Gummies, pop rocks, tiny candy-covered chocolate ovals and, of course, the milk chocolate that binds it all together. The mix of flavours in the first chunk tasted like a particularly chocolatey Big Turk bar that popped as it dissolved. Utterly strange, yet very entrancing. 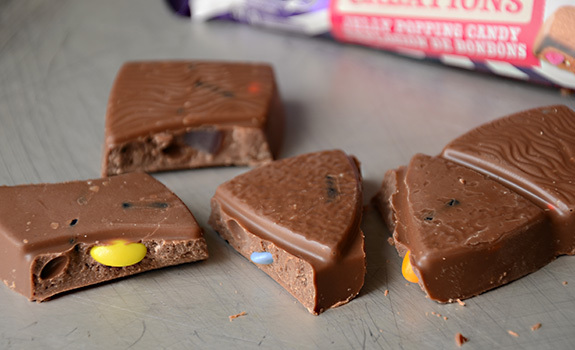 See all the little bits of candy inside this Dairy Milk Marvellous Creations Jelly Popping Candy bar? It pops in the mouth as it dissolves, and little chewy chunks of gummy candy are an unexpected surprise. Cost: $1.26 for a 47-gram bar at Save-On-Foods in Edmonton, found on sale for $0.99. Value for cash money: Good. Nutrition? : Per bar (47 grams): 240 calories, 12 grams of fat, 40 mg of sodium, 0 grams of fibre, 3 grams of protein. The verdict: The best part of this chocolate bar isn’t the taste; it’s the fun factor. Several decades ago, a chocolate bar was a special treat. These days, chocolate bars are a relatively mundane, ordinary snack. This bar brings some of that child-like magic back. A few years ago I bought some little Smarties-dotted chocolate bars that included pop rocks; it was the only time I ever saw them, and I wish I’d bought every one in the store. Call me a semi-minimalist, but I think the gummies in this bar are overkill, interfering as they do with the exuberant clarity of the basic snap/crunch/pop sequence of the aforementioned Smarties bar. Curious. Where did you find them? Canada or the UK? In this Dairy Milk creation, I found that the candy-coated chocolate pieces were the odd man out. They contribute crunch and sweetness, but otherwise it’s sort of just chocolate wrapped in candy wrapped in chocolate. Not that there’s anything wrong with that. 🙂 The mix isn’t always the greatest in the bars, so it’s possible to get several pieces without any gummies, then one piece with three. This is cutting-edge food science right here, so there are bound to be a few rough edges. I found the Smarties bars at Save-On-Foods in Edmonton; they were marked down for quick sale, so I think they were a failed experiment. I think you may have a point about the redundancy of chocolate-on-chocolate, but I stand firm in rejecting anything reminiscent of a Big Turk, which was one of the biggest confectionary-related disappointments of my childhood. I agree I love these but not for the taste so much but for the fun in the mouth feel….. I love this chocolate bar. I just discovered it here in Ontario, Canada a few months ago and I really enjoy the chewy, crunchy and popping textures in the chocolate.